Sometimes we like to go “backstage” and scout out the Latina talent in the wings–the people with the skills to make those in the spotlight shine a little brighter. These are the shyer counterparts to limelight lovers and often the work they do is equally amazing and just as important. We are pretty excited to hear that Stephanie Manriquez, the Proyecto Latina feature in October will be arriving with a multi-media presentation of her work. Our reading series continues to tour the south side and we are thrilled to be returning to the Carlos and Dominguez Fine Arts Gallery. As always the Chisme Box will be taking your confessional and gossipy bits. We want to know what you’ve been working on so make sure to ask about Open mic sign-up if you plan to participate. Monday, October 17, 2011 @ 7 p.m. While working at Radio Arte, Stephanie satisfied her quest for shedding light on social justice issues that affect the Latino communities such as the anti-immigrant movement here in the United States. 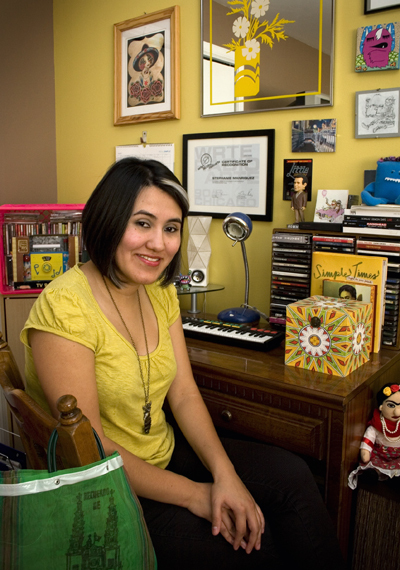 Due to a lack of contemporary spaces within the Latino communities in Chicago and in conjuction with other independent artists she decided to organize the first Festival of Latino Electronic Music in 2007. This summer marked its 4th anniversary with over 13 Latin American artists of international stature that imparted workshops and conducted discussions on digital, experimental and audiovisual art plus presented electronic music of different genres. She has participated with audio pieces and/or audio documentaries at many sites such as the National Museum of Mexican Art, Pilsen Open Studios and in a compilation of audio work from CONACULTA Chihuahua with her piece titled, Tribute to Juarez Women. Currently she collaborates with several publications such as El Extra Newspaper, Chi-remezcla, Pilsen Portal and Revista Contratiempo. As part of her collaboration with Contratiempo (2008) and as member of their editorial team (2010), she sharpens her focus on issues of the Pilsen community, its art and its people.